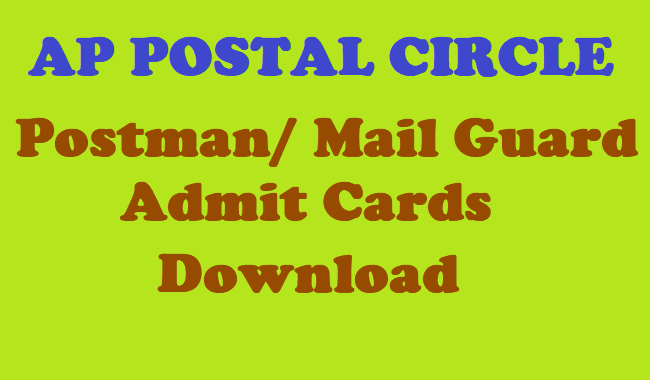 AP Postal Circle Postman/ Mail Guard Admit Cards 2018 Download - Andhra Pradesh PM/ MG Hall Tickets, AP Postal Circle Postman, Mail Guard Admit Card 2018,The AP Postal Circle Postman, Mail Guard Admit Card 2018 has been released online at the official website of AP Postal Circle. Candidates have to download the AP Postal Circle Postman, Mail Guard Admit Card 2018 by entering the right credentials at the admit card downloading page. Andhra Pradesh Postal Circle has scheduled to conduct the postman/ mail guard examination on 28th & 29th April 2018. All the applicants who are going to face the written test round can download AP Postman/mail guard admit card from the AP postal Circle official portal, appost.in. 1. The candidates to bring TWO COPIES OF THIS ADMIT CARD along with your original photo identity proof and PHOTOCOPY OF THE SAME, issued by the Central/ State Govt or original 10th class certificate with photo or Voter ID or Aadhar Card or passport copy or ID card issued by School or College with photo and to produce the same in the examination hall for verification of their identity with the details in admit card. The photocopy of the same photo identity card should be handed over to the room invigilator. 2. You are requested to appear for the written test at the centre on the date and time specified below. Paste your recent passport size photograph on the space given above, on both the copies of admit card, failing which you will not be permitted to attend the examination. 3. The admit card should be brought to the examination centre and handed over to the room invigilator. 4. You should reach the test centre before the reporting time as mentioned above. Candidate coming late beyond 15 minutes from start of the examination shall not be permitted to appear in the examination. 5. Your candidature for this test is provisional and is subject to your fulfillment of the prescribed educational and other eligibly conditions etc. as per department rules, failing which your candidature will be summarily rejected at the further stages of verification and scrutiny during the selection process. 6. Request for change of test centre/test date and address of correspondence shall not be entertained under any circumstances. 7. You may kindly note that no traveling expenses will be admissible for appearing in the examination. 8. Please note down your roll number and registration number for future reference and keep a photocopy with you as this admit card in original will be collected from you. 9. Please ensure that you bring with you blue or black ball point pen for appearing in the written test. 3. After that, candidates will be redirected to the Login page. 6. The admit card can also be downloaded from the official website of AP Postal Circle.